Google has launched itself into the social media sector with Google+, trying to dig its way into turf currently occupied by the likes of Facebook and Twitter, and we're giving it a whirl to see how it goes. Now this is far from the first time Google has dabbled with such things, and there's giveaway clues in some of the links, featuring blink-and-you-miss-it mentions of such things as Google Wave, but this seems like a more substantial effort than previous ones. One of the neat ideas at its heart is Circles. Rather than, as with Facebook, all your friends, colleagues and acquaintances being lumped into a single feed, you assign each of those you connect with a place in a different circle. So good friends you can pop in one circle, that friend you only agreed to add because frankly it was easier than saying no you can stick in a distant acquaintances only circle, people you do business with you can pop in a business circle. The advantages of that are that you can share messages specifically with one circle, or all. You may hear less stories of people complaining as on Facebook "I am soooo fed up of work" only to forget they had added their boss who promptly tell them they're fired. I swear that story is an urban myth, but it's a fun urban myth, so let's not disprove a good thing. In business terms, it means of course you can happily have business colleagues in one circle and family and friends in another, and share appropriate messages with each. A good thing - perhaps the one to be looking over its shoulder at this should be Linkedin. Your public profile is also searchable on internet databases, so it would seem. So it's wise to make sure that is as tame or as extreme as you're happy to be found as when folks tap in your name. The meat of the experience is in keeping up with feeds from your friends, and this is very much like the Facebook feed in many ways, although at present clear of game notifications, which you either love or hate depending on whether you play them or not, I would imagine. What stands out as most different from Facebook is the Hangout. This is a refinement of the Google Chat software - something I've used for years and which I've always found to be a very stable format. 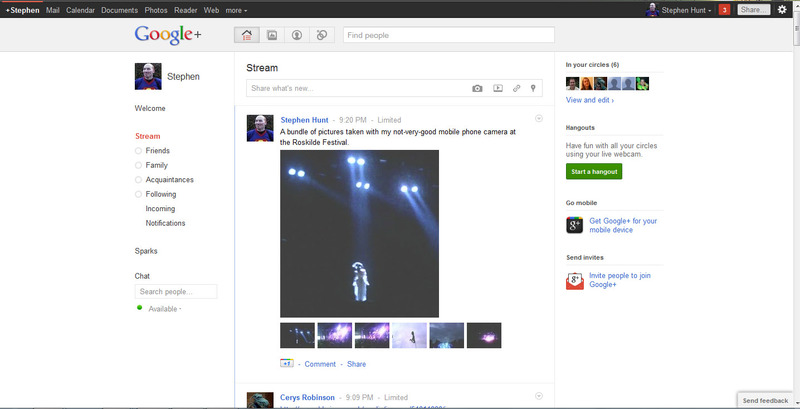 Hangout expands that to voice and video chat for a group. Video conferencing all wrapped up in the social media format. It seems to work fine, and I can definitely see uses for it, both in business and, hobby wise for me, with online RPGs. Negatives that I've found so far? For me, it's a little too spartan right now, and I had repeated difficulties uploading video to the site. That's not too major right now, as it may just be a temporary hiccup, but could be a serious negative if it remains a problem. 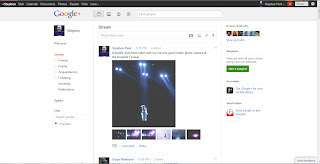 This is early days for Google+ and there's a lot more to come. It's available on mobiles, of course, and there's certainly going to be features added along the way. I know of at least one friend who is ditching Facebook completely to opt for Google+ instead, but I think for me it will remain one of several options. Of course, Facebook has a history of responding to competitors, so how long will it be before a form of Circles makes its presence known there? And there have already been news reports of a Facebook deal with Skype which will integrate video conferencing with the main Facebook site. For now, I'll give it a whirl, and add some feedback as the site grows. Feel free to share your own experiences in the comments section below. PS Interesting to note that Blogger, as yet, only has a Google Buzz link and not a direct "Share to Google+" button. It'll be interesting to see how quickly that gets added in. My first post was 'it's like showing up to a party where people are milling about waiting for the band to arrive, but feeling psyched because they got there early'. Well, the band still hasn't set up - but everyone's beginning to pull up comfy chairs and hand around bowls of munchies. It's all good. So basically, it's time to just wait around for the lights to dim and have enough people gathered to let out an almighty "Whooooo"?